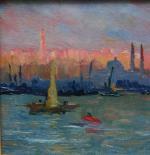 Impressionistic study with view of Istanbul from the seaside was executed in the early 20th Century in the manner very close to seascapes by Diyarbakirli Tahsin (1875 Diyarbakirli, Turkey - 1937). Diyarbakirli Tahsin, named after his birthplace Diyarbakirli, is considered one of the most important Turkish artists of the early 20th century. He mainly depicts the sea, whose multi-faceted spectacles characterize his oeuvre. Tahsin studied at the Military Academy in Istanbul, which he left in 1895 as a cavalry officer. Parallel to his successful military career, he was promoted to the rank of major, Tahsin was constantly active as a painter. Between 1914 and 1918 he served in the Public Art Institute of the General Staff and was commissioned numerous depictions of naval battles. In addition, Tahsin also produced masterful paintings that were purely depicting atmospheric seascapes. Literature: Artist lexicons by Bénézit (in French), Comanducci (in Italian), Thieme/Becker and Fuchs ( (both in German), in on-line : mutualart.com. Inscriptions: signed illegible with Arabic litters. Technique: oil on wood, gold-plated frame. Measurements: unframed w 8 3/8" x h 4 5/8" (21,3 x 11,7 cm); framed w 9 1/4" x h 5 1/2" ((23,5 x 14 cm).